Open the email you wish to reply. Scroll down to the bottom of that email. Out of the three suggested responses, select the one that is most appropriate and tap on it. The reply screen will open. If you need to edit the response, you can and then tap Send. Do note that, Gmail doesn’t show suggested replies for all the emails you receive. In the Gmail app, tap the hamburger menu icon and then, Settings. Uncheck the Smart Reply option in Android or toggle it in iOS to turn off. 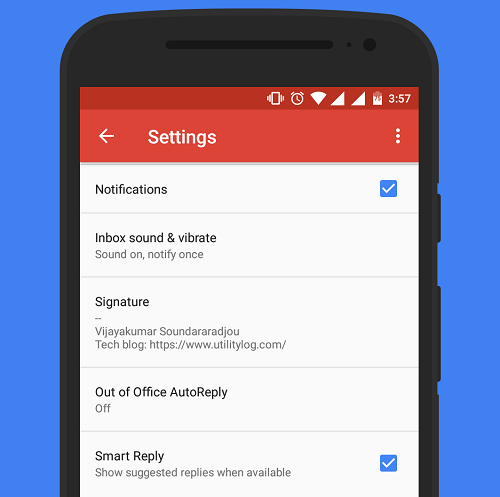 Turn off Gmail Smart Reply (Android). For behind the scenes look at how this feature works, check out the Google Research Blog.